Goals by Alvaro Morata, Ross Barkley, Willian and Ruben Loftus-Cheek gave Chelsea a resounding 4-0 victory against Burnley and move into second spot on the Premier League table. 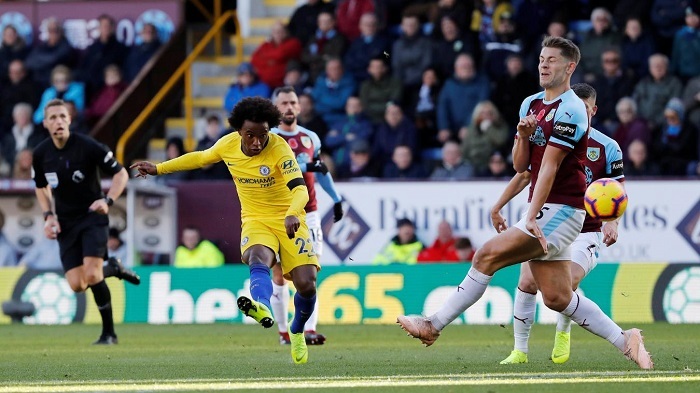 The Blues made light work of Burnley in Eden Hazard’s absence – the Belgian missing with a back problem – as a devastating attacking display saw off the Clarets and moved Maurizio Sarri’s side up to second in the table, two points behind leaders Liverpool. Barkley’s deft pass in the 22nd minute set Morata up for Chelsea’s opener and the England international scored in his third consecutive Premier League game 12 minutes into the second half to put the game beyond Sean Dyche’s side. Joe Hart had to be alert to deny Chelsea a 12th-minute opener, the Burnley goalkeeper pawing away Morata’s instinctive header from Barkley’s scuffed shot. Robbie Brady – making his first appearance in 10 months after a knee injury – then flashed wide for the hosts before Willian went agonisingly close to breaking the deadlock, his precise effort coming off Hart’s left-hand post. There was no such luck for the Clarets in the 22nd minute when Morata slotted into the bottom-left corner after latching onto Barkley’s incisive through ball. Morata then squandered two golden chances to cement Chelsea’s superiority before the interval, first dragging wide after cutting inside Ben Mee and then firing straight at Hart after being picked out by Jorginho. The rejuvenated Barkley doubled Chelsea’s advantage in the 57th minute, bursting forward from midfield and drilling into Hart’s bottom-left corner from 25 yards. Barkley is a player reborn under Sarri. His pass for Morata’s opener was exquisite and his surge and finish for Chelsea’s second was devastating in its speed and precision. Chelsea host club legend Frank Lampard’s Derby County in the EFL Cup on Wednesday, while Burnley’s next match is a visit to West Ham in the Premier League on Saturday.